NOTE: While doing pool table slate repair and prep remember this: NEVER EVER NEVER EVER lift or pick up your pool table from the top!! Especially from the end… Imagine how the pool table will flex from end to end, and what it will do to your pool table’s slate as it binds… Get a small bottle jack from the trunk of your car, or from the garage, find the supports under the pool table, and lift it from underneath, and in the center of the pool table. DON’T screw up your pool table! 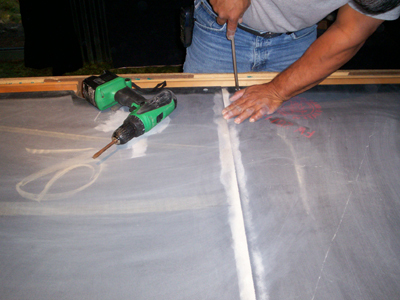 Not only will you need to level the pool table overall, but you will also need to check each of the individual pieces of slate as well, because, although the pool table itself might be level from end to end, and from side to side, there might be variations with each piece of slate. When you are leveling your pool table, try to use different sizes of levels… a six or eight foot level for overall length, a three or four foot level for leveling from side to side, and a two foot level for leveling the individual pieces of slate where necessary. Always use the longest level you can to get the most accurate readings possible when leveling your table, and be sure to flip the level over so you can be sure your reading is true… if your level isn’t level, the bubble won’t give you a correct reading. 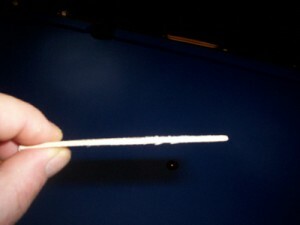 These photos are of slate shims that are used to level your pool table. Just slide them under the slate of the pool table while you have it loosened up. You can also place them under the legs of the table. 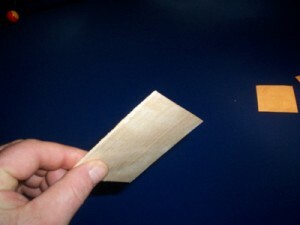 These shims are made of wood, but there are plastic slate shims available as well. 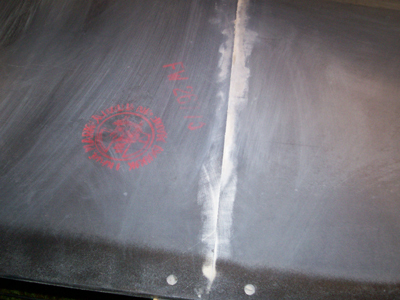 In this picture, you can see that when this table was set up, they used some sort of a fixall cement repair product to seal the slate.Allen said to avoid these products because, although this this table looks pretty good for its age, the material can chip, and you’ll end up with little grains of it under your new felt.So if you encounter this problem in your pool table slate repair I recommend what we did… use sealing wax instead of or to seal over it! 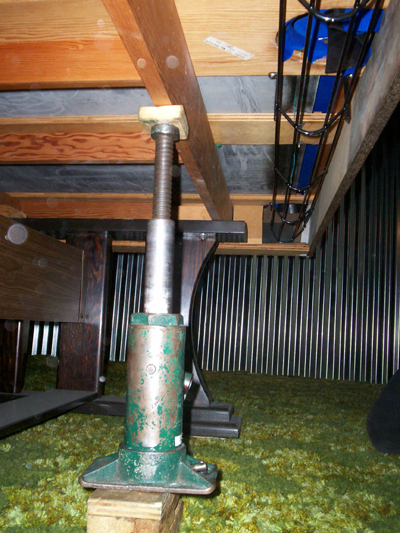 When leveling the table, loosen the bolts where necessary, and place wooden or plastic shims under the slate. Then screw the bolts back down nice and tight. Be sure to use at least a four foot level (preferrably a 6 foot level) when you do this, then check, and recheck, and then check it again. There’s no sense in ending up with a table that isn’t perfectly level if you’ve already come this far. Okay, that’s enough to take in on one page.